The first day of Fall is finally here and I’m ready to welcome it with open arms! Since Fall is the season of Pumpkin Spice EVERYTHING I made a Pumpkin Spice Icebox Cake to welcome the season. An icebox “cake” is more like a tiramisu than an actual cake with layers of cookies and a luxurious mascarpone cream filling. For this Pumpkin Spice Icebox Cake I used Snickerdoodle Cookies (I used a Box of Big Kahuna Fundraising Cookies from my freezer, after all we sell frozen cookie dough for a living) and spiced up the mascarpone and cream filling with pumpkin, spice and everything nice! Add the mascarpone cheese, pumpkin puree, sugar, spices and vanilla to the bowl of an electric mixer and beat well. Add in the 2 cups heavy cream and beat until thickened. Using a 9-inch springform pan, arrange about 8 cookies in the bottom of the pan, then break up 1-2 cookies and fill in any gaps to form a bottom crust. Then pour in about a quarter of the pumpkin mixture. Then repeat 3 more times ending with a layer of the pumpkin mixture. Cover with plastic wrap and refrigerate for 24 hours. In the bowl of an electric mixer add the 1 cup whipping cream, sugar, cinnamon and vanilla extract, beat until stiff peak form. Transfer to a zip top bag fitted with a star attachment and pipe on in desired pattern. Top with candy pumpkins and Enjoy! P.S. How what are your favorite things about Fall? I’ve never done an icebox cake, but I love snickerdoodles and pumpkin, so I’ll have to give it a try! wow!!! this looks so awesome! This looks lovely – the cinnamon whipped cream and the candy pumpkins make for a wonderful presentation! It’s difficult for me to pinpoint my favorite things about fall, but certainly apple cider doughnuts and the beautiful fall colors are high on my list – two things I didn’t really get to experience very much until I moved out of CA after college! Mmmm Apple cider doughnuts sound amazing right now and I totally agree with you about the fall colors. Thanks for commenting and have a great day!! 😀 Thanks Tonya!!! nothing like a some pumpkin spice to celebrate the Fall season!! P.S. Typo (Mascrapone) in the ingredients. Thanks Stefan!! 😀 and thanks for the heads up on the Mascarpone typo. As soon as I saw that this was similar to tiramisu, my eyeballs perked up (is that a thing? ), I’m going to have to try this! Love icebox cakes. Those little pumpkins are so cute, I love how you decorated it! Thanks!! 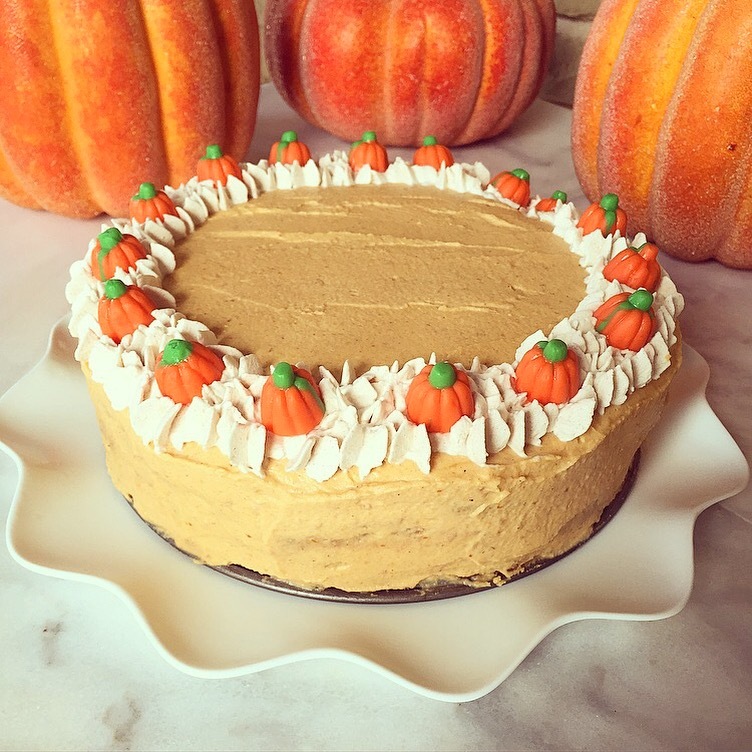 I love icebox cakes too because the flavors can be so easily interchanged for the seasons… But anything with candy pumpkins is always a plus for me. Oh and I would say that eyes can totally perk up. This looks like so much fun cake–a Thanksgiving feast trooper!! the only cookie cakes I know of are from when we lived in Spain and friends made a cake of layered plain vanilla cookies, sprinkled with whiskey and layered with custard! I like your version better. And the little pumpkins on top are perfect!! thanks for the recipe– I’m so really for fall eating! I always enjoy hearing about you living in Spain as its one of the place I would love too see someday soon. What I like about cookie cakes like this is you can transform them into anything flavor. As for all the little pumpkins… I bought a whole container to decorate the cake and I’ve almost eaten them all… One of my favorite fall concoctions is cocktail peanuts and candy corn (on in this case pumpkins) it’s so addicting. Sugar and peanuts– irresistible. When candy corn comes on the market each fall I mail a bag back to my daughter– she loves it! What a beautiful cake! Mine would look like a Pinterest Fail, LOL. I’ve never been good at decorating a cake. I do enjoy fall but I am NOT ready for it this year for some reason. p.s. Snickerdoodles are one of my favorite cookies! Good to hear from you Kathryn!! Wow! This looks amazing! What a great cake recipe! Can’t wait to try it. Pinned! Thanks for visiting Inspiration Thursday. I’m so happy to meet you. Hope to see you again this week! I’m glad to meet you. Thanks for liking my post. 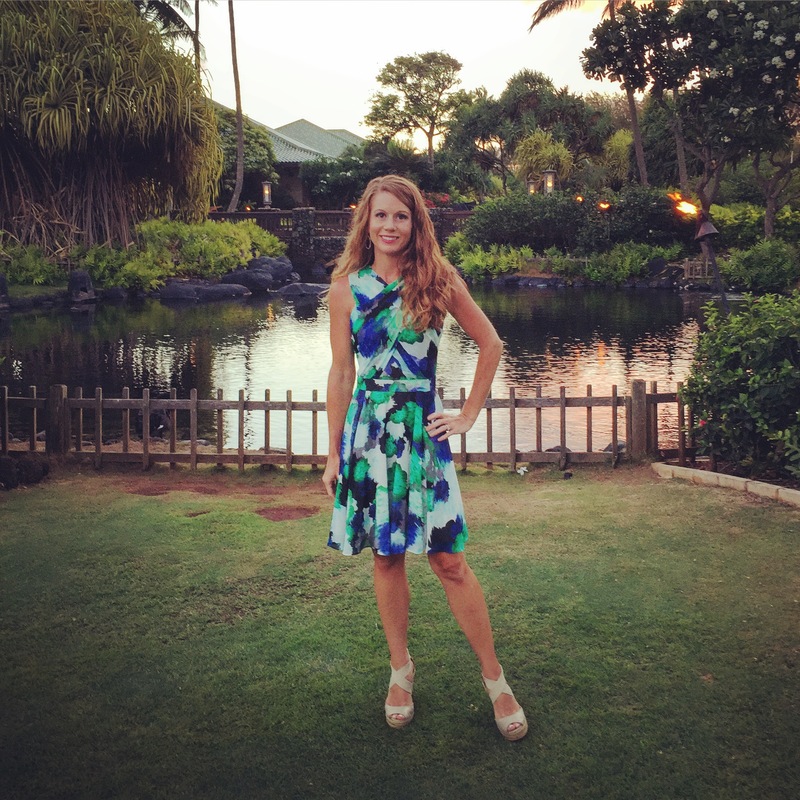 New to North Texas I’m happy to find a fellow blogger here. 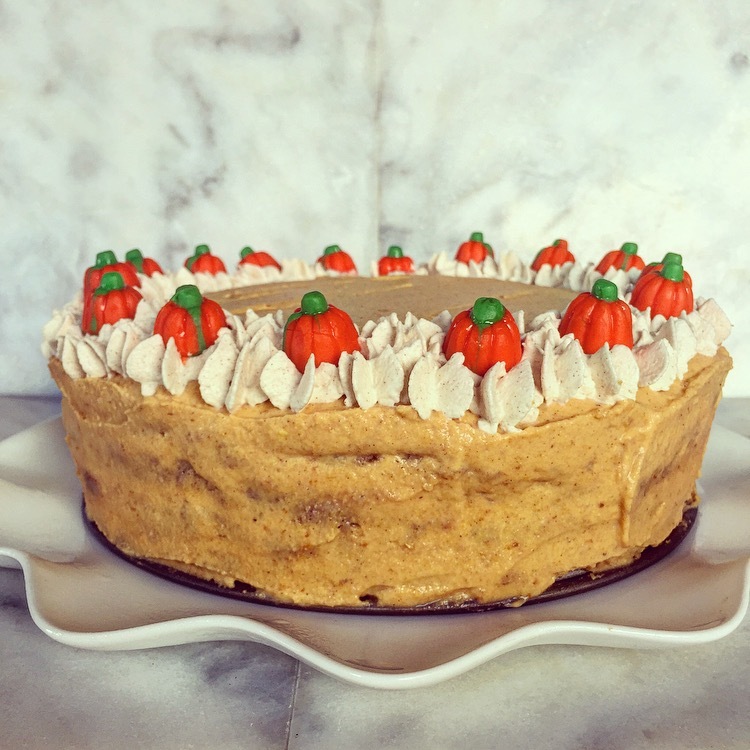 The pumpkin refrigerator cake sounds and looks delightful. I must try.